Credits: I partnered with Lewis on this project. He did the visuals, I did the copy. Brief: Create a Nike-led campaign that will help create the environment needed for professional footballers to feel confident enough to be openly gay, and reach 100% of their potential. Your sexuality isn't what makes you a professional athlete - it's your performance. So only your performance should matter. To demonstrate this, Nike will release a 'Gay' football boot. 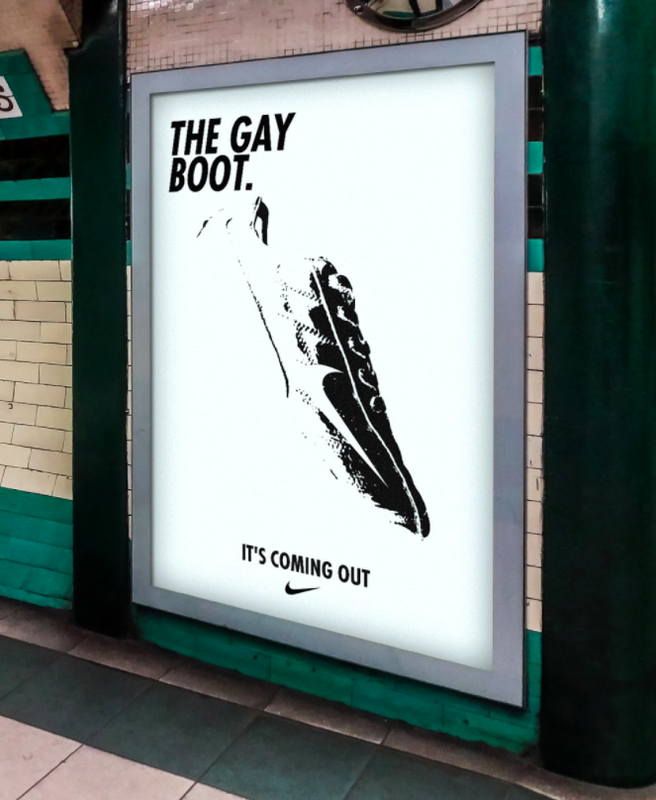 We'll begin with Nike announcing that a ‘Gay Boot’ is ‘Coming Out Soon.’ A teaser campaign will invite the public to guess what it looks like. Will it be covered in rainbows? Gay icons? What will make it different to other Nike boots? The answer? Nothing. On release day, an existing pair of Nike football boots will be sold in new ‘The Gay Boot’ boxes, with new labels attached. By having an existing pair of Nike football boots ‘come out’ as gay, we’re going to show that it’s performance that matters. That the only thing that makes these boots different is the boxes we put them in, the labels we put on them. We’re going to send home the message that it’s the same for gay players. And we’re going to do this all with one pair of boots.